Arm knitting is super easy and fun — no knitting needles required! In this class you will learn how to knit giant loops back and forth across your arms and then how to assemble the knit piece into a cozy cowl. Cara Corey, the owner and maker behind Cara Corey Designs, also explains how to select a super chunky yarn for arm knitting. You do not need to know how to knit to take this class. This is a great project for beginners. You can make your cowl a single loop or an extra long double loop. Even a longer cowl can be knit in less than an hour. Once you know how to arm knit, you can use this technique to make other things, like big blankets. 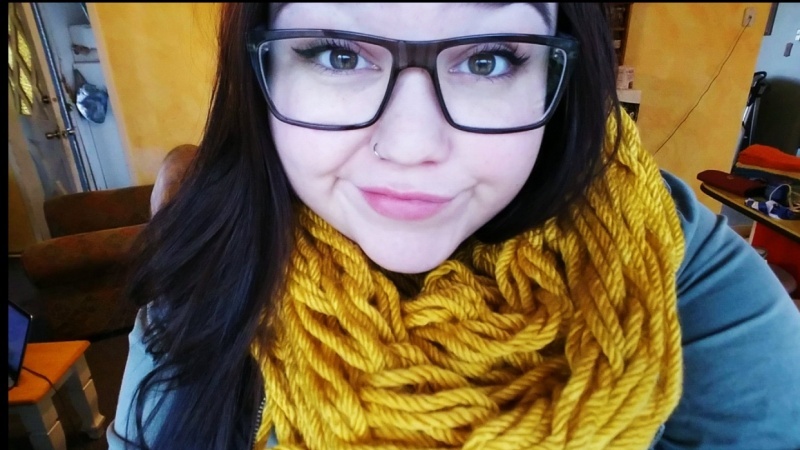 Create your own arm knit cowl and share a photo in the project gallery. Hi, I'm Cara and I'm a former journalist-turned-pattern designer. I specialize in modern knitting designs using giant needles and unique materials (see my work at caracoreydesigns.com). I make everything from hats and scarves to pillows, poufs, and other home decor. I absolutely love knitting and crochet, and I couldn't put my needles down if I tried. I have two little kids, so my plate is very full right now, but I believe you always have to make time for creativity.